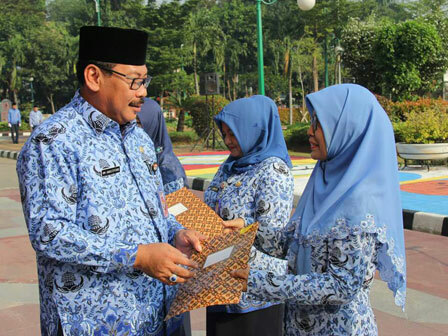 West Jakarta Mayor, Anas Effendi, led the ceremony of National Education Day (Hardiknas) on the yard of the mayor office, Tuesday (5/2). It was attended by the officials and apparatuses.
" We need to ponder for a moment to look back and then look forward to achieve the ideals of a coveted national education future"
He disclosed that Hardiknas became the momentum to reflect on the efforts being fought, as well as to devise future strategies to realize the desired national education. "We need to ponder for a moment to look back and then look forward to achieve the ideals of a coveted national education future," he expressed, when he read a speech of Education and Culture Minister. He said that the Act on National Education System/2013 mandates national education is based on Pancasila and 1945 Constitution. While national culture is the root of national education. "On that basis, we're committed to develop an education that is sustained and illuminated by national culture. Let's put together a determination to strengthen education and promote culture," he stressed. The ceremony itself was filled by Adiwiyata Award to SDN Duri Kepa 07, SMPN 201 and SMAN 65. And handover champion I healthy school competition towards Tunas Bangsa Kindergarten.